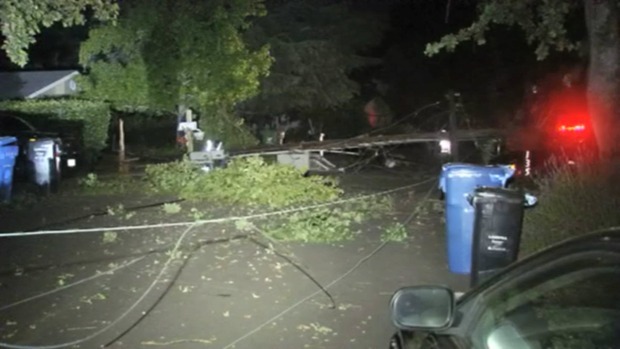 A weather-damaged tree in Danville fell down overnight, knocking out power lines and leaving hundreds of PG&E customers in the dark, according to city officials. Pete Suratos reports. A weather-damaged tree in Danville fell early Tuesday, knocking out power lines and leaving hundreds of PG&E customers in the dark, according to city officials. Chunks of the downed tree, which split an electricity pole in half, were seen in the backyards of homes on the 100 block of Verde Mesa Drive, just blocks away from Monte Visa High School, which didn't lose power. The outage, which occurred around 1:45 a.m., initially affected an estimated 2,800 PG&E customers. As the day progressed, that number dropped to 611 and then to 482. Los Cerros Middle School is without electricity, but classes are in session. School administrators, who were told the outage will last until about 2 p.m., will bring in generators and cold lunches for students. According to city officials, PG&E crews are on the scene working to restore power. There is no estimate on when electricity will be restored. Verde Mesa Drive is blocked by a firetruck because first-responders say the area is unsafe until PG&E has been able to secure the lines.